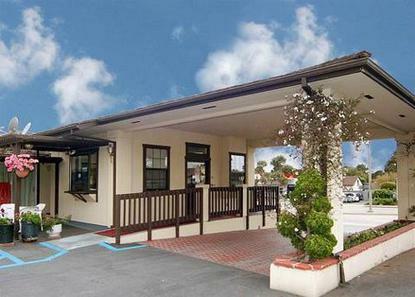 The Econo Lodge Monterey Fairgrounds hotel is conveniently located within walking distance from the Monterey Fairgrounds. This Monterey hotel is minutes away from attractions including Fisherman's Wharf, Pebble Beach, 17-mile Drive, the Monterey Bay Aquarium and Cannery Row. Guests are invited to enjoy amenities like free continental breakfast, free coffee in the lobby, free local calls and free HBO. The hotel has a seasonal outdoor pool and spa. In addition to standard amenities all guest rooms come equipped with refrigerators and microwaves in most rooms. All rooms are airconditioned. Non-smoking and handicap rooms are available upon request. Nearby services include laundry facilities, airline ticket desk, car rental, and copy service.